Auto-archive is an easy way to hide old projects and tasks. into a simple view filter on the top of the left panel. Need to clean up your screen from old projects and tasks? Sure, you can use the "active" checkbox and hide all the closed ones. But what if you still want to see them, but only for a certain period of time after they have been closed? Auto-archive filter does exactly that! When you turn auto-archive on, it will hide all the projects and tasks closed more than X days ago (14 days by default). You can modify the auto-archive period through the Settings menu on the top of your 5pm screen. Please note that Auto-archive is just a personal filter. 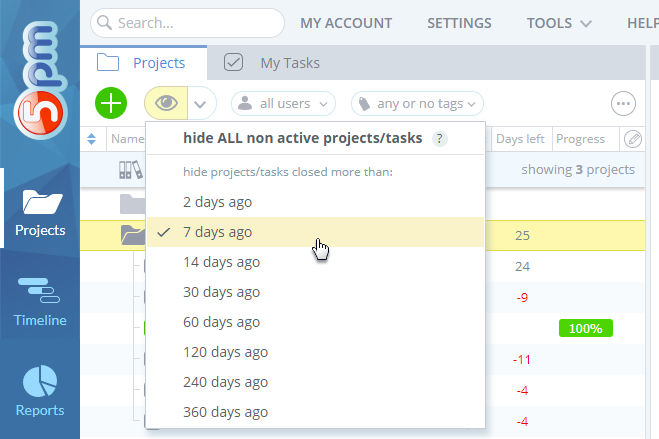 Each user can enable or disable it at any time for their own 5pm view to show/hide old closed projects and tasks.